When Brunel Torque Limiting Clutches are installed on large ratio reduction gear boxes care must be taken since it may not be practical to set a torque limiter mounted on the input shaft low enough to provide the proper torque protection on the output shaft. The large reduction ratio will also decrease the accuracy of the output release torque setting if the clutch is located on the input shaft. When selecting Torque Limiting Clutches for use in high inertia drive system, the location of the clutch must be between the high inertia load (flywheel, large pulley or gear, etc.) and the driven mechanism. Locating the Brunel overload release clutch in this position will protect the driven mechanism from the large inertia forces. For systems requiring very low torque levels and greater range of adjustment sensitivity. For applications where heavy braking is applied. Type JA only. For heavy overrunning applications which require normal release torque setting in one direction and a lower torque release setting in the opposite direction. Type JA only. Decide on manual or automatic reset. Choose a position as near as possible to the expected overload (see fig 1 above). Calculate the torque setting required at that position. This can be determined from the motor power, r.p.m. 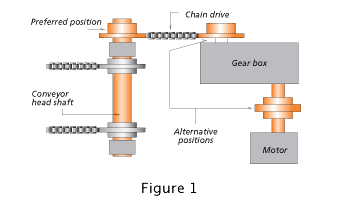 and gearing ratio to the driven load or from the maximum permissible torque for drive components such as compressive stress on keys. It is the weakest component that requires protection. Make allowance for motor starting torques (generally twice normal running torque). Having calculated an approximate setting for the release torque, final adjustments can be made on site. Check from tables that shaft, sprocket or pulley, etc. can be accommodated. Manual reset clutch capable of 1000 lb ft torque complete with flexible coupling for shaft-to-shaft application. Type and sizes of accessories, i.e. sprocket, pulley, etc. Any special requirements such as shifter flange, neoprene seals, etc.